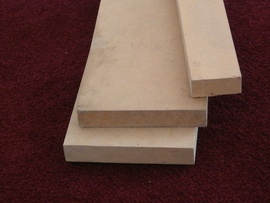 An acronym for Medium Density Fiberboard composite, a type of board made from wood fibers that are mixed with wax and resin binders, and formed into boards using high temperatures and high pressure. Particle board is a similar product, which is less dense and less smooth than MDF. One of the major advantages of MDF over wood is that it is 1/4 to 1/10 the price.